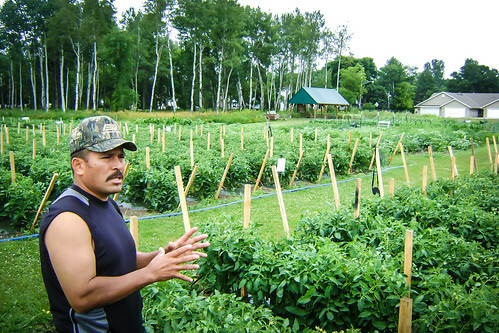 Members of the Agua Gorda Cooperative are growing organic produce for the Minneapolis market. Photo courtesy Latino Economic Development Center. October is National Cooperative Month, and we're happy to spotlight several projects throughout the month that have been supported through USDA Rural Development's Cooperative Services. Jaime Villalaz, a business development specialist with the Latino Economic Development Center in Minneapolis, Minn., provided us with a glimpse into how USDA funds are being used to promote agriculture and cooperative development in the Latino community in Minnesota. 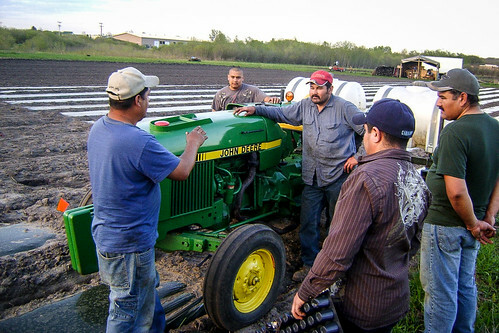 In 2011, staff from the Latino Economic Development Center (LEDC) in Minneapolis met with about 30 residents of Long Prairie, Minn., to discuss starting a farmer cooperative that would improve their income and promote economic development. After meetings throughout that winter, the cooperative became a legal entity in April 2012. The eight original members each contributed $250 to start the Agua Gorda Cooperative. The co-op’s founding members had done farm work most of their lives, but operating their own business was a new experience. The first step was to train the members in cooperative organization, business management and in the basics of raising organic produce. LEDC, as a sponsoring organization, hired an experienced Latino organic farmer to provide training. With a $5,400 loan, guaranteed by LEDC, the city of Long Prairie leased the co-op six plots in the city’s community garden. Agua Gorda’s first year of operation was a modest success. It sold nearly $7,000 worth of crops (about half sold locally), and co-op members were able to pay back their loan. After the first year, the co-op expanded to farming three acres in Long Prairie’s industrial park, which vegetable crops were planted. Sales grew to $18,500, but the co-op sold only half of its produce. In 2014, Agua Gorda expanded operations to 5.5 acres, bought a tractor and other farm equipment. Sales climbed to $42,000. Much of the sales resulted from working with another marketing cooperative and entering into a contract with a Minneapolis restaurant and food wholesaler under which the co-op would supply 30,000 pounds of tomatillos (a staple of Mexican cuisine) and 3,000 pounds of Serrano peppers. Agua Gorda became a founding member of Shared Ground Farmers’ Cooperative in Minneapolis, which sold its members’ produce through a Community Supported Agriculture program and to upscale restaurants. This year, Agua Gorda has again expanded its acreage/production and has been certified for organic production and Good Agriculture Practice on its 5.5 acres. In addition, the cooperative has leased an adjacent 54-acre property with an option to purchase the land. LEDC has developed a beginner farming model for Latinos wishing to farm. Called “farm incubator cooperatives,” the goal is to create a pathway for low-wage farmworkers to become farm owners. LEDC’s loan program incorporates micro-farming loans which include working capital and equipment loans. Latino Economic Development Center has found that access to land is the highest barrier for Latinos to enter into farming, but – by being united in a co-op – this becomes a more viable option, as shown by Agua Gorda’s experience. Co-op members develop a game plan for the day’s work. Photo courtesy Latino Economic Development Center.